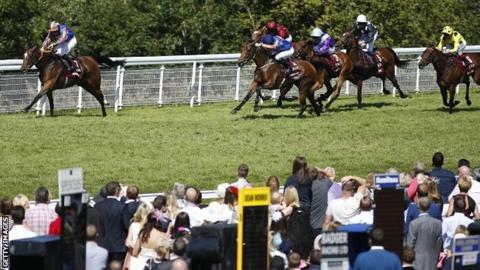 Favourite Legatissimo, ridden by Wayne Lordan, won the Nassau Stakes with a confident run in the Group 1 race at Glorious Goodwood. Wedding Vow finished second with Arabian Queen third. Star of Seville, ridden by Frankie Dettori, led the running but 2-1 shot Legatissimo, trained by David Wachman, soared into the lead with a furlong left and was never likely to be caught. "She's a very high-class filly and has plenty of speed," Lordan said. The 1000 Guineas winner continued a magnificent season, having narrowly lost in the Investec Oaks and the Pretty Polly Stakes at the Curragh. "She has everything, she was just unfortunate to lose out by a short head on two occasions, but she is back to her best again," Lordan added. "I rode this filly earlier in her career, it's unfortunate Ryan Moore is out with his injury, but I was delighted to get back on her." Trainer David Wachman said: "Legatissimo was very good and Wayne gave her great ride. "She showed a really good turn of foot, just as she did in the Guineas, and I would say anything between a mile and 10 furlongs is ideal for her. "There are plenty of options for her between now and the end of the year. We could think about taking on the boys but I will have to speak to the owners first." Winning owner Michael Tabor, whose colours were also carried by Wedding Vow, said: "She is very good and she showed her true worth today, which we always thought she had. I think she has been a bit unlucky this year. "I didn't really mind which filly won although, having said that, I would have preferred this filly to win - I think she deserves it. I like to think the well-bred fillies can do the trick." In the Stewards' Cup, Frankie Dettori took first place on Magical Memory ahead of Toofi in second place and Rivellino in third. It was the 44-year-old Italian's sixth win of the week.